July 25, 2018 (Washington, D.C.) — Jumpstart is proud to join dozens of leading higher education advocacy organizations in endorsing the Aim Higher Act, a comprehensive reauthorization of the Higher Education Act that puts students first. Jumpstart is excited to see the inclusion of a number of key provisions for which we have been advocating for in the legislation. The Aim Higher Act provides an affordable pathway from high school through career for all students with a focus on traditionally underserved college students, including those from low-income families and those who are first-generation college students. This legislation not only makes college more affordable by lowering debt, but it also strengthens programs that build tangible workforce skills while in school, such as Federal Work Study. Each year, Jumpstart leverages $5 million in Federal Work Study funding to ensure that all students have the opportunity to serve children, engage in their community, and prepare for a career in early childhood education through Jumpstart. Double the federal allocation to Federal Work Study and modernize the funding formula to allocate funds to universities based on the number of low-income students at each institution, allowing Federal Work Study funds to go directly to the students most in need. Expand Teacher Education Assistance for College and Higher Education (TEACH) Grants to aspiring early childhood educators, encouraging more early childhood educators to earn post-secondary degrees, incentivizing aspiring educators to join the field, and retaining more qualified educators in early childhood classrooms. Simplify the Free Application for Federal Student Aid (FAFSA) to allow students from low-income families to more easily qualify for the Federal Student Aid that they need to pay for college. Increase the minimum Pell Grant award and permanently index the grants to inflation. This change would allow this aid to meaningfully impact the skyrocketing cost of college and meet the needs of students. Invest in the Child Care Access Means Parents in Schools (CCAMPIS) program, allowing student-parents to thrive in school and graduate more quickly while expanding access to early childhood education for the young children of students. 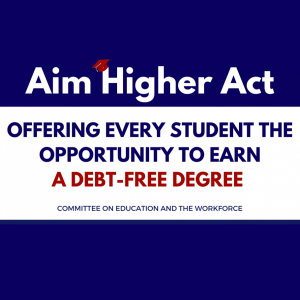 The Aim Higher Act would meaningfully make college more affordable and valuable to millions of college students and aspiring college students. At Jumpstart, we know that the work of supporting and expanding affordable high-quality early education does not begin or end in the preschool classroom; we must create opportunities for college students to become early educators. Expanding opportunities such as the TEACH grant to include early educators (something Jumpstart has previously advocated for) puts a degree within the grasp of those in charge of teaching our youngest learners. As we have learned from engaging thousands of college students in service each year, many students struggle to afford college while also failing to gain all of the necessary training and experience they need to succeed in their careers. Early educators, who receive wages significantly below their elementary school teacher counterparts, face unsustainable futures, and are unable to make ends meet between low salaries, high debt, and a lack of training. This important legislation provides students the pathway to attending, affording, and succeeding in college. 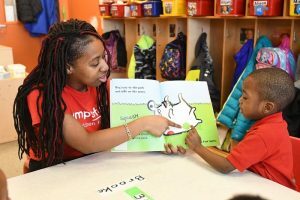 Jumpstart believes in educational equity — not just for our youngest learners, but also for the college students who implement the Jumpstart program in the classroom. Just as supporting kindergarten readiness helps to give all children the opportunity to succeed, improving college access and affordability is a critical step to breaking the cycle of poverty. In alignment with Jumpstart’s Policy Principles, this legislation invests in our nation’s future workforce and our nation’s economy by investing in students. Jumpstart is proud to join other national advocacy organizations including the Center for Law and Social Policy, the Education Trust, the National Association for College Admission Counseling, and the National Association of Student Financial Aid Administrators to endorse this landmark legislation for students.